Reduces the pitch and volume of crowing. As poultry keepers with several roosters, we are aware that crowing in the early hours of the morning and throughout the day can be annoying to neighbours and also get on your own nerves. Our Crow Control Collars are an effective way of reducing the noise of crowing. The collar does not prevent crowing and we do not market them as "No Crow" collars. He will still crow but the collar will restrict the force of air past the vocal cords and in most cases, reduce the pitch and volume. We are successfully using these on our own roosters. These collars may not be the solution for every rooster and results may vary, as some roosters can be particularly difficult to shush. But its worth a try and our collars have saved the lives of hundreds of pet roosters that would otherwise have been destroyed for noise reasons. Sizes available: Bantam for small breeds, Adult for large and heavy breeds. Colours: Royal Blue or Rainbow. Our collars are being endorsed by District Councils throughout New Zealand. This is not a shock device. Made from quality polypropylene webbing with genuine Velcro fastenings for long lasting grip, our crow control collars are flexible, fully adjustable and designed to fit snuggly around the rooster's neck without causing discomfort. Instructions on how to fit the collar are included. Great trader, collar works perfectly. Fantastic, fast and efficient trader. I highly recommend these crow control collars to anyone wanting to keep their roosters without upsetting the neighbours. Thank you so much for the trade. I am now able to keep my beloved rooster and my neighbours are no longer complaining about the early morning wake ups. Great trade. Initially didn't think it was working, but after a quick readjustment, the collar is a success! Great trade thanks very much - collar works good. Cheers. Great trade, it really works! Just had to adjust collar over the first few days. Great purchase, crowing volume has gone down heaps & rooster still very happy! Very happy with service and products from here! The crow collar seems to be working! I haven't heard Mr Rooster trying to crow since I adjusted the collar. It says they don't STOP a rooster from crowing, but it appears to have done so for mine currently! Which is awesome, so Mr Rooster hasn't had to visit freezer camp! How to fit: Crow control collars are to be fitted half way down the neck. Place over the throat feathers and lift the hackle feathers on the back of the neck. With the straight edge with the Velcro hook side facing upwards and away from the skin, lap the curved edge over and fasten. A few adjustments may be necessary to find the right tension, and may need refitting from time to time. Do not fasten too tight. There is a fine line between just right and too tight. We suggest fitting it loosely at "training strength" at first, to accustom him to wearing the collar, then adjusting the next day. You should be able to slip your pinky finger (a small finger about the thickness of a pen) under the collar. Important: Owners are responsible to ensure the collar is fitted correctly so as not to cause choking or distress. Sunset Croft accepts no liability for loss or injury caused by incorrect use. 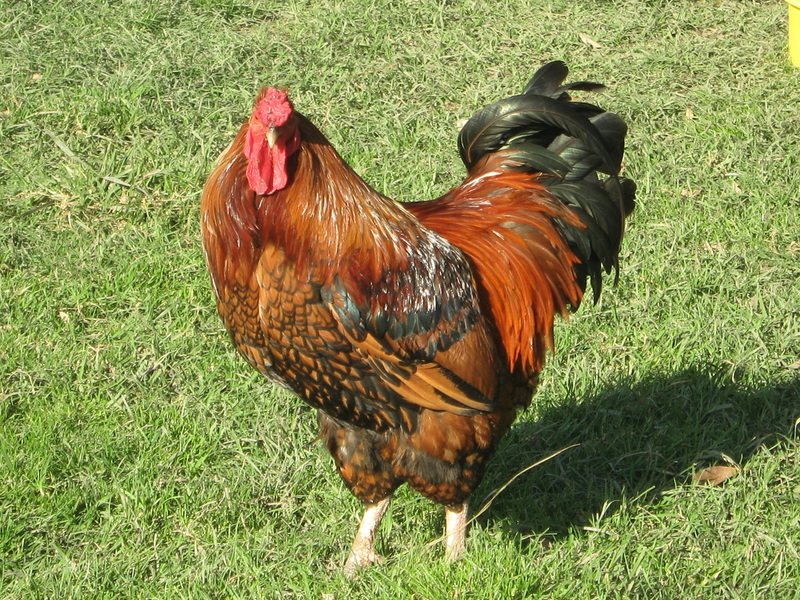 Once fitted, observe your rooster for a while to ensure he is not coughing or choking. He is likely to walk backwards at first, so ensure there are no objects nearby that he may hurt himself on. He will quickly settle down and become used to wearing the collar. Check he has a full crop at roosting time. If it feels empty, the collar may be too tight and he isn't able to eat properly. Remove and inspect collar regularly for mites and lice which may be harbouring in the fibres, causing irritation. Crow collar is completely concealed beneath hackle feathers.